Ph.D. graduates Johnasha Stuart, left, and Kimberly Cooney are both moving on to Emory University for their postdoctoral work. June 11, 2018 | June 11, 2018 | Two Ph.D. students in the spring graduating class of the UAMS Graduate School have accepted positions at Emory University in Atlanta to continue their postdoctoral work. Kimberly Cooney completed the Graduate Program in Interdisciplinary Biomedical Sciences program at UAMS and participated in the Initiative for Maximizing Student Development (IMSD) program, which aims to increase the number of students from underrepresented groups graduating with doctorates in the biomedical sciences. At Emory University, she’ll be working in the College of Medicine studying cardiovascular disease and its role in upregulating inflammatory signaling pathways. During her tenure at UAMS, she was mentored by Giulia Baldini, M.D., Ph.D., where her studies focused on the function and trafficking of the Melanocortin-4 Receptor, a receptor that influences appetite regulation and energy expenditure. That experience helped her discover her passion for obesity research and other areas that can directly impact her community. “I can see the work I did at UAMS translating later and I want to continue doing relevant research, particularly in areas of health disparities,” Cooney said. Cooney’s ultimate career goal is to establish a lab, possibly in an academic setting, that focuses on clinical research while mentoring other minority students in STEM areas. 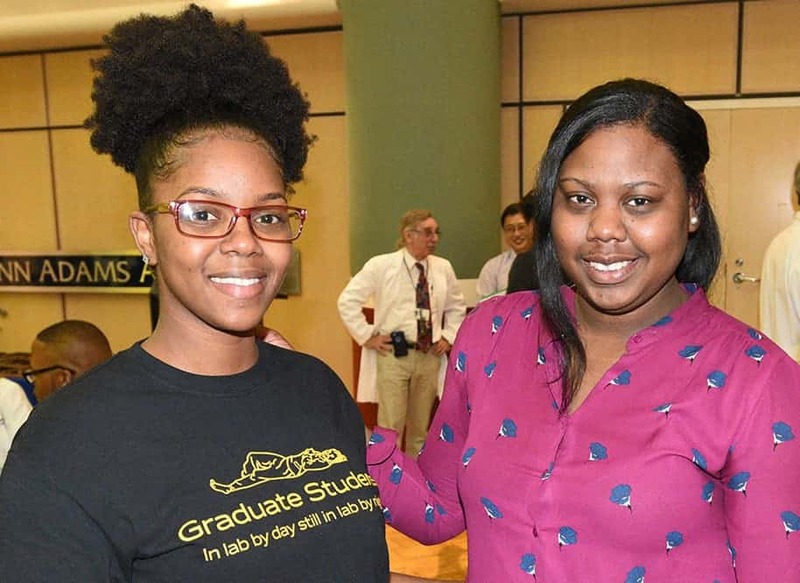 Johnasha Stuart, who is also an IMSD scholar, conducted her graduate studies and training in the Microbiology and Immunology Department with Karl Boehme, Ph.D., at UAMS. At Emory, she will be working with Arash Grakoui, Ph.D., on Hepatitis C virus pathogenesis and its involvement with the immune system and how contribution to liver disease. “At UAMS, I have already had the experience of working in a virology lab, which has given me a good basis for my next step,” Stuart said. Stuart also credited the Graduate Student Teachers of Central Arkansas for providing her with opportunities to advance her teaching experience and achieve her career goals. “My goal is to become an independent researcher and educator so that I can use my research as a platform to educate and encourage students to pursue careers in biomedical research,” Stuart said.